In a perfect world, men and women invited to weddings would respond promptly and, for unmarried guests, indicate whether or not they’re taking a date. But not all guests respond quickly, and some may forget to respond at all, even if they intend to make the wedding. According to various wedding advice experts, including the book “Countdown to Your Perfect Wedding,” couples should assume 80 percent acceptance for a traditional wedding and 60 to 70 percent for destination weddings. Weddings that fall during weekdays, take place on holidays or during times of the year when the weather can be difficult may affect attendance as well. 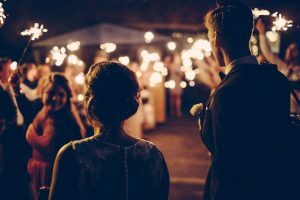 Some couples may be tempted to create a “B” invitation list of people who may not make the first cut due to budgetary constraints, but can be invited if family members cannot attend. This is a delicate situation, and some people may be offended if they find out they were not among the initial list of invitees. As a result, it can be better for couples to narrow down guest lists early on and mail all invitations at once. Send the invitations early enough so adjustments can be made with vendors, including the receptive venue and the caterer. When estimating costs based on wedding guests, it’s safer to round up than down so couples are not caught unaware. Overbuy and save receipts as items can be returned later.